As predominantly an aircraft and armour modeller, I claim no expertise either with regard to the history or the design features of tram-cars. However, having grown up in Melbourne, Australia, I well remember countless rickety and drafty rides on our local trams – and I take every chance I can to repeat the experience whenever I return. The following is an adapted version of the history contained in the kit instructions. The tram-car series ‘X’ was produced by Mytischi carriage-building plant with the assistance of specialists from Kharkov. The prototype successfully passed tests and was approved as the standard vehicle for all cities in the USSR in 1927. By the end of 1938 tram-cars of series ‘X’ were used in 73 cities across the Soviet Union. 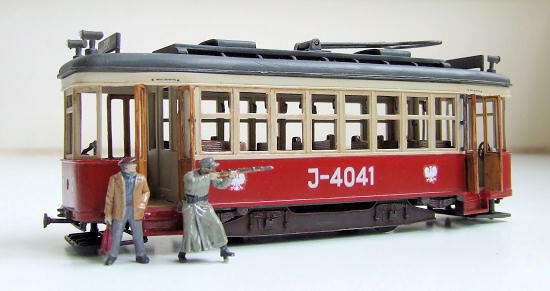 During World War II the tram-cars took on special significance in view of the shortage of transport. These vehicles were used to carry workers to military factories and for supplying the building materials to defence construction works, while some were modified to become ambulances. Series ‘X’ tram-cars took part in the evacuation of industrial plants in Kharkov, hauling factory equipment to nearby railway stations. After the war modified versions of series ‘X’ were used until the middle of the 1960s, including some adapted to act as repair vehicles. The last tram-cars were withdrawn from service in the mid-1980s. Having never built an MW kit before, I was relatively impressed with this model. The plastic used and the quality of the mouldings remind me strongly of Pavla, although as I understand it MW hails from the Ukraine rather than the Czech Republic. The kit contains a plethora of parts, many of which – such as window panes and interior grab-handles – are repeated ad nauseam. The total parts count is well over 200 pieces, including the very welcome addition of a nice vacformed base featuring a cobbled street with inlaid tram-tracks (21 x 11 cm or 8.25 x 4.24 inches). This not only comfortably accommodates the built model, but is complemented by two ornate posts to support the overhead electric lines. Overall the plastic is reasonably well moulded, albeit with some colour differences between each sprue. However, there were a few small flaws in the mouldings (mainly streaks in the middle of larger pieces) and the clear parts were not especially clear. There is also an 8-page A4 instruction booklet with very clear sequences – including detail diagrams for tricky steps – and a small decal sheet containing logos, tram numbers and a Cyrillic destination name. I didn’t use these so I can’t comment on their thickness or opacity. The instructions provide illustrations for one colour scheme from the 1930s–40s, with shades named and coded only to the Humbrol range. After making allowance for the large parts count and associated preparation of small pieces, construction of this model is relatively straightforward. This, however, may be because I cheated. 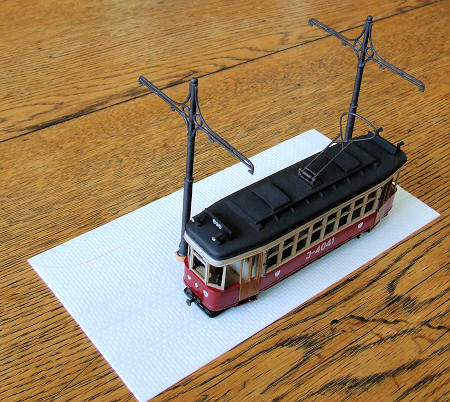 Given that I intended the tram to form part of a larger diorama, I chose not to install any of the window panes. This obviated any concerns about marring or fogging the clear plastic when installing each piece, and greatly speeded painting. I didn’t fancy masking 52 separate windows – and doing so both inside and out. 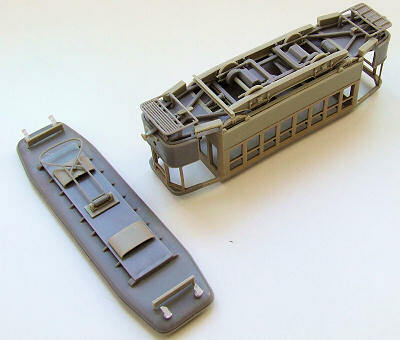 This means that after the mould seams are cleaned up on most of the pieces, the tram can be put together in relatively straightforward subassemblies. I built the chassis with running gear, paying particular attention to align the walls with the cab sections to keep everything square. The interior as well as exterior joins need to be sanded smooth as they are all visible in the assembled model. The roof structure and pantograph were built as a subassembly – it is worth taking the trouble to ensure that the pantograph isn’t glued in place as this will assist in aligning it later with the overhead wires, if desired. Keeping the roof separate until the final stages both assists with checking on the alignment of the chassis and painting the interior. The running gear on the underside is complex but well laid-out in the instructions, although I ended up omitting a few stray pieces. I assembled the passenger seats but left these and the interior grab-rails off until after the interior walls were painted; ditto for the doors and external handrails. In fact, the only real assembly problem I found with the tram was after painting, when the doors would not fit into their allotted spaces without some slicing, and the window frames on the side of the cab were simply too large for the place they are intended to occupy. In fact, the most fiddly construction step was building the two tram-line poles, which required a lot of careful sanding to keep relatively round and not to lose the moulded-in detail. Once again, I cheated. Originally I had based my idea on a wonderful image of an ISU-152 assault gun dragging a tram down a war-torn city street. But could I find that photo when it came time to paint my tram? 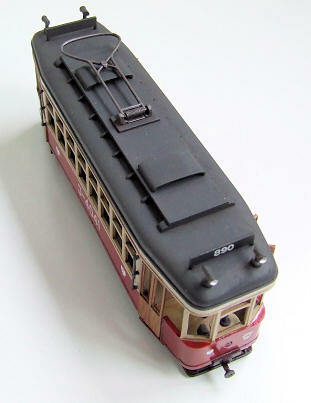 I therefore decided to include the tram in a larger diorama representing Berlin in 1945. So I looked the other way and pretended that this was actually a German tram-car. There, I’ve said it. For those of us who enjoy armour but aren’t fascinated by metropolitan transport, I thought this was an acceptable subterfuge. To be fair, the design is relatively similar to photos I’ve seen of German vehicles from the same era. MW’s suggested colour scheme is very attractive, featuring white above scarlet sides, with black running gear and a dark grey roof. I altered this slightly to replace the white with a creamier colour and a dirty black for the roof. I painted the interior in the matching cream colour, while the seats, hand-holds and doors were painted in an attempt at wood effect. This entails undercoating in an enamel pale yellow or tan, followed by an acrylic dark brown top-coat. To achieve this effect, I use the unstirred pigment from the bottom of the brown jar (I use mainly Gunze acrylics), while loading the brush largely with the clear fluid from the top half of the jar. With a bit of patience this creates streaks on the surface that approximate wood grain; it works better some times than others. Technically I should have carried the effect on to the window frames too, but that seemed a recipe for disappointment so I left well enough alone. Leaving out the kit’s Soviet decals, I hunted in the spares box for some German-looking lettering for the tram’s side (I think it came from a Swiss Hawker Hunter kit! ), plus various small logos and German stencils. I would have loved a white town name for the destination boards, but no such luck so I used some numerals instead. This just left some model railway lenses for the main headlight and roof-top lamps. Most of the model was then detailed with a thinned wash of burnt umber oil paint, with an extra-heavy coating on the running gear. For the moment I have left the roof separate until I place the tram in the diorama, so that I can place some troops in it, at which point I will complete the weathering to better blend it into the scene. This is quite a detailed kit that presents few construction challenges, although if you insist on installing glass in the windows then I’d suggest laying in a stock of clear styrene and plenty of masking tape. Whether as a colourful display model on its own, or as part of a diorama (er, even if you cheat a little), it certainly makes an interesting diversion from small-scale armour kits. The addition of the vacformed base and associated poles makes this quite a neat little package and good value for the price.